Today we would introduce AKUN, an online aplication based on financial accounting, functions as a Cash Book to record your daily expense and income. With AKUN, you can take notes, analyze, even share your accounting journal and daily financial transaction by online and realtime. AKUN is a simple application. AKUN can be used freely by anyone. A brand new way to manage your bussiness and personal financial. You have crowded schedule? Want to control your finance everywhere? Financial accounting software are too expensive? AKUN should be your solution for managing your financial. AKUN know how to manage your money with easily and detailed. A solution if you need a anti-busy and free accounting software. Firstly you can use AKUN’s feature for your organization, community, or business. As we understand to your need, AKUN was made for simplest usage with more feature to help you control your financial. You can note your transactions with easily, save your daily income and outcome in categorized data then display it for your monthly report. And even your smartphone or PC was broken, your data still secured by AKUN properly. 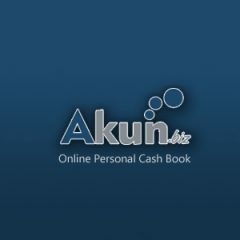 AKUN have Cash Book feature to note your income or outcome then insert in your chosen category. Also note your transaction with simple and easy. And when you want to see your financial accounting report, Monthly and Anually cash report will display it in detailed view. You can also note your daily schedule, bills, or even note your unexpected inspiration that came out suddenly with Note tool. We hope AKUN can grow more and more to help your financial with up to date features and services. We will add some more feature in the future. Follow our latest news on Facebook, Google+, or at Twitter. You can start enjoying AKUN Cash Book application by register here. Selain beberapa akun sosial media di atas yang sudah disebutkan di akhir, tolong nanti disertakan email juga. Karena lebih mudah mengikuti kabar terbaru via email.